The EUROCOM Uno 3.0 is designed primarily for corporate customers, the Eco-Friendly 120 Watts, 7.5kg (16.5lbs) easy to move around All in One PC allows companies to improve overall productivity and security, reduce downtime caused by power interruptions and greatly reduce energy costs. The EUROCOM Uno 3.0 has an integrated battery pack, which provides backup power in case of electrical failure, or unstable incoming electrical current, while also allowing for easy relocation without system shutdown. When AC power suddenly shuts down, backup battery can keep you working for up to 70 minutes and/or allow users to save uncompleted documents. The long list of innovative features of the EUROCOM Uno 3.0, allows companies to deploy more efficient computing infrastructure for their employees than traditional desktop systems. Designed for integration into larger companies, hospitals and Industrial Installations to provide an extremely energy efficient solution. 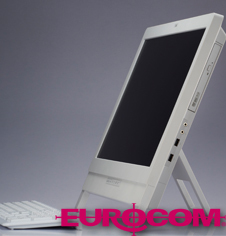 An All in One Desktop PC, with no tower or cable mess, the EUROCOM Uno 3.0 has a sleek design and adjustable stand that can also be removed for wall mounting. A 21.5”optional Multi Touch display, internal battery pack, energy efficient power supply and TPM 1.2 module are just a few of the innovative technologies being employed inside the Uno 3.0. The Uno 3.0 is designed for reduced energy consumption and energy efficiency with a maximum power draw of 120W. The ultra efficient 120W 100-250V Auto-switching external AC Adapter improves the overall energy conservation. The EUROCOM Uno 3.0 has an integrated 6-cells, 62.16WH battery pack, which provides backup power in case of electrical failure, or unstable incoming electrical current, while also allowing for easy relocation without shutdown. When AC power suddenly shuts down, backup battery can keep you working for up to 70 minutes and/or allow users to save uncompleted documents. When AC power suddenly shuts down, the backup battery can help keep you working or to save uncompleted documents before power down. The energy efficient Uno 3.0 consumers only 120W versus 200W-600W for a traditional desktop PC. (53W min mode, 120W max mode; 2W standby, 1 W off mode. The low power consumption equates to lower thermal temperatures which results in a longer expected lifespan of internal components. The integrated Trusted Platform Module 1.2 ensures that information like keys, password and digital certificates stored are made more secure from software attacks and physical theft. The increased security, brought on by the TPM 1.2 can significantly save organizations in IT management cost. An integrated Kensington Lock Slot allows users to lock the Uno 3.0 to a secure object to ensure the security of the system. Security isn’t only concerned with theft and the like, the Uno 3.0 also employs power security in the form of an uninterruptible power supply (internal battery pack) for up to 70 minutes of backup power. The EUROCOM Uno 3.0 is a totally flexible, configurable and customizable system in terms of storage, memory, processor, and even an option between Multi touch and non touch 21.5” displays. The integrate 2.0 megapixel full HD webcam is perfect for video calls and video conferencing. Equipped with a VESA mount, the Uno 3.0 can be mounted on tables, walls, desks, medical carts or nearly anywhere for ultimate convenience, deploy-ability and ease of use. The VESA mount is accessible once adjustable stand is removed, the stand can be adjusted for viewing angles of 5 degrees to 53 degrees. Eurocom has included a wide array of ports to ensure the Uno 3.0 fits seamlessly into any environment. Apart from the standard USB 3.0, HDMI 1.4a out, Audio in and out, RJ 45 LAN port the Uno 3.0 also comes equipped with two RS-232 serial and two PS/2 connectors. RS-232 ports are frequently used in the point of sale hardware such as thermal printers, receipt printers, barcode scanners and cash registers turning the EUROCOM Uno 3.0 into a complete point of sale system. The PS/2 port allows for compatibility with legacy hardware and is also favoured for security reason in corporate environments. An ExpressCard 54 slot in the EUROCOM Uno 3.0 allows for peripheral devices to be connected, increasing functionality. Less desk space required due to small, compact, All in one Small form-factor Design, measuring: 527(W) x 49(D) x 370(H)mm or 21.08(W) x 1.96(D) x 14.8(H)inch and a lightweight of 7.5kgs / 16.5lbs. Major IT cost reductions over traditional desktop PCs as a small footprint, All-in-One design allows for faster installation, relocation and operation at user's location. Low Environmental impact and Low Carbon Footprint. Low cost disposal due to usage of non-toxic, recyclable materials and lightweight small footprint design: 100% ROHS Compliant; weight 7.5kg (16.5lbs). Extreme energy cost reductions due to low energy consumption. 120W versus 200W-600W for a traditional desktop PC. (53W min mode, 120W max mode; 2W standby, 1 W off mode. Increased lifespan due to lower power consumption. A low power consumption equates to lower thermal temperatures which results in a longer expected lifespan of internal components. Substantial office space savings due to compact all-in-one design. Less desk space required due to small, compact, All in one Small form-factor Design, measuring: 527(W)x49(D)x370(H)mm or 21.08(W)x1.96(D)x14.8(H)inch and a lightweight design of 7.5kgs / 16.5lbs. Highly flexible, fully customizable and upgradeable design to meet enterprise and/or individual computing requirements. The Uno 3.0 is customizable based on the Processor, Hard Drive, Memory, Display, Graphics, or optical drive.